Watch us share our mission with the Affordable Canopy Act & How you can join the fun! An underserved school or athletic organization receives their very own custom canopy, custom sidewall, photo backdrop, tablecloth and a banner flag through the Affordable Canopy Act. That no matter where they come from or their financial circumstances, they too belong, deserve to be recognized, and acknowledged for who they are and the school or team they represent. Whether you are purchasing custom canopies for your school, organization or business – every time a purchase is made, at no added cost to you – you are making an impact and helping fund the gift of a custom canopy to underprivileged schools and athletic organizations through the Affordable Canopy Act. Help us spread the word and let’s make a difference in the lives of students and athletes together! With a simple step by step process, everyone wins! There is no out of pocket cost to anyone. 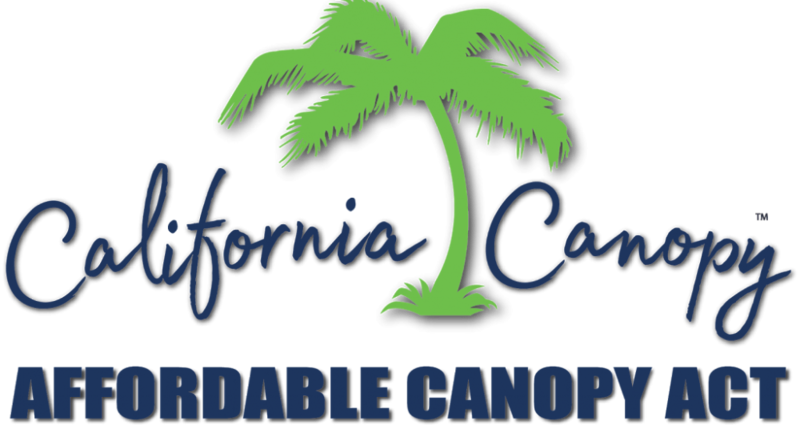 California Canopy will give a portion of every canopy sale to the Affordable Canopy Act. Every month California Canopy will present one custom canopy to an underserved school, club, team or athletic organization. Registered partners help California Canopy locate underserved schools, youth groups or teams within their own organization. Partners identify one or more team(s), leagues, clubs or schools within their organization that they believe best qualifies and would most benefit as the recipient of a custom canopy through the Affordable Canopy Act. On a regular basis California Canopy will present (1) custom canopy, (1) custom sidewall, (1) photo backdrop, (1) banner flag and (1) custom tablecloth to a registered partners constitutes. The recipient will be one of the previously identified underserved teams, leagues, clubs or schools. The recipients will help design their custom canopy and have it shipped directly to them. We believe everyone deserves to have a custom canopy in their team environment to assist in building unity, confidence, brand awareness and protection from the sun and rain. Everyone deserves to feel and know they belong, no matter where they come from or their financial circumstances. We are here to make a positive impact in the lives of those who may not have all the luxuries of their competition, but act with the heart of champions. Why the Affordable Canopy Act? California Canopy believes that everyone should have access to quality custom canopies without breaking their budget to purchase them. That’s why California Canopy offers professional grade custom canopies at wholesale prices. We are helping make the unaffordable, affordable. Offering an affordable solution to schools and athletic organizations in their efforts to look good, feel united and build brand awareness while providing adequate shelter, is something that we are extremely proud of. California Canopy wanted to take action and make an impact, but more than that, we wanted others to feel the benefit of making a difference together. Everyone plays a role in helping underprivileged schools and athletic organizations through the Affordable Canopy Act. Every time someone purchases one or more custom canopies, they are helping fund the gift of a custom canopy to an underprivileged school or athletic organization at no out of pocket cost to them. Every time a custom canopy is presented to an underserved school or athletic organization, they are pre-qualified by an approved Partner of the Affordable Canopy Act. These partners help identify recipients within their own organization that would most benefit from receiving a custom canopy based on the circumstantial and financial limitations.